Many of the surviving monuments in the south transept of Ardfert Cathedral, which I visited yesterday afternoon, were to the Talbot Crosbie family. 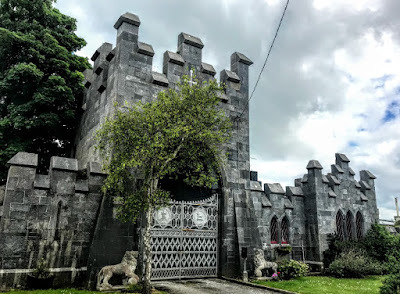 The Crosbie family were granted land in the Ardfert area by Elizabeth I in the late 16th century, and John Crosbie became Bishop of Kerry in 1600. 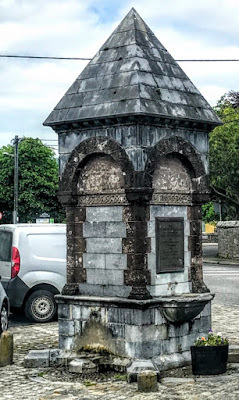 So, it seemed obvious that many of the prominent architectural sites I should see in Ardfert as I went to lunch later in the afternoon are legacies of the Talbot Crosbie family, including the Glandore Gates, the Talbot Crosbie Memorial Fountain and the Ardfert Parish Room. Ardfert Abbey was the seat of the Crosbie family, later the Earls of Glandore. Over the generations, the Crosbie family was influential in local and national politics, including MPs, Privy Councillors and Governors of Kerry. Maurice Crosbie (1690-1762) became first Baron Brandon (1758). His son, William Crosbie (1716-1781), became Viscount Crosbie (1771) and Earl of Glandore (1776). When John Crosbie, 2nd Earl of Glandore, died in in 1815 the titles of viscount and earl died out and the title of Lord Brandon passed to his cousin, William Crosbie (1771-1832) as the fourth Baron. He was the son of the Very Revd Maurice Crosbie, Dean of Saint Mary’s Cathedral, Limerick. Lord Brandon was also a priest in the Church of Ireland, and was Rector of Castleisland, Co Kerry. The titles died when he died in 1832. Ardfert Abbey eventually passed to the descendants of the second earl’s sister, Lady Anne Crosbie, who in 1775 married William John Talbot, a descendant of the Talbot family of Mount Talbot, Co Roscommon, and Templeogue Castle Co Dublin. In the mid-19th century, William Talbot Crosbie was living at Ardfert Abbey. By the end of that century, it was the home of Colonel John Darnley Talbot Crosbie in 1894. In 1906, it was the property of Lindsay Talbot Crosbie. 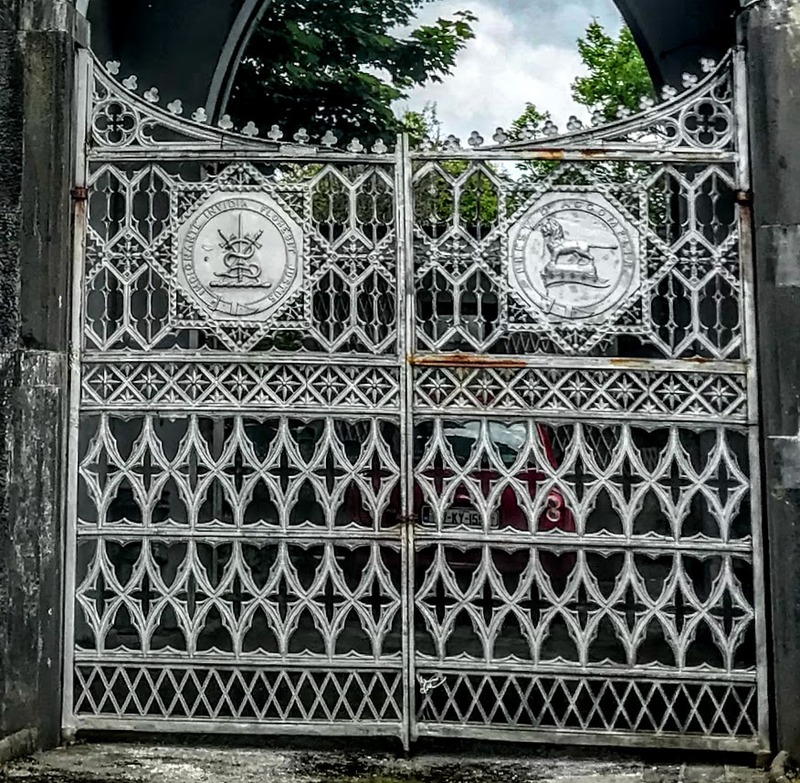 The imposing entrance was built ca 1815 by John Crosbie, Earl of Glandore, at one of the entrances to the Crosbie mansion, and was relocated to its present position in the 1880s. The house was burnt during the Civil War in 1922, but the elaborate entrance gate in the heart of Ardfert is now a private dwelling and remains as a reminder of the influence of the family. The Glandore Gates comprise a pair of limestone ashlar piers with a lancet arch to the centre that has a battlemented parapet over, and cast-iron gates and a curved screen wall to north. 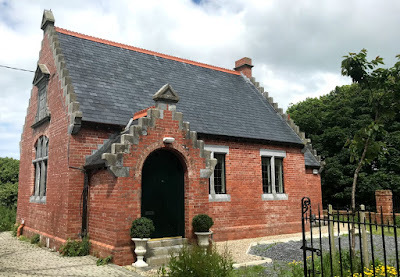 There is an attached, two-bay, single-storey, flat-roofed Gothic Revival gate lodge to the south, comprising a single-bay linking bay with lancet arch openings and a single-bay advanced end block that has a battlemented parapet and a curved screen wall to south. 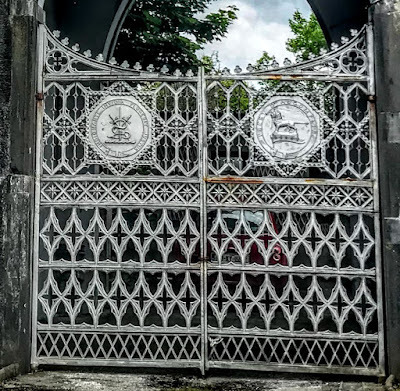 The iron double-leaf gates display the crests of the Crosbie family (left) and the Talbot family (right). Across from the gates, the Talbot Crosbie Memorial Fountain is a free-standing Hiberno-Romanesque memorial fountain, erected in 1901. To the east of Ardfert Cathedral, the Ardfert Parish Room is a detached three-bay single-storey meeting hall with dormer attic, built around 1915. It was built with red-brick English garden bond walls and with a projecting plinth by the local landlord Lindsey Talbot-Crosbie, and it is currently undergoing restoration. This building has a single-bay single-storey crow-stepped gabled projecting porch to left, crow-stepped gable ends and single-bay single-storey recessed end bay to east. There is a pedimented limestone name plaque on the west gable. There are timber, multiple-pane, casement windows with limestone sills, lintels and mullions and chamfered brick reveals. The projecting gabled porch has a round-headed doorway with a brick arch. There is a square-headed doorway at the east end with a limestone lintel.